When some idea developed in different research fields meet, we may expect something new to emerge. I have been interested in designing and synthesizing molecules. 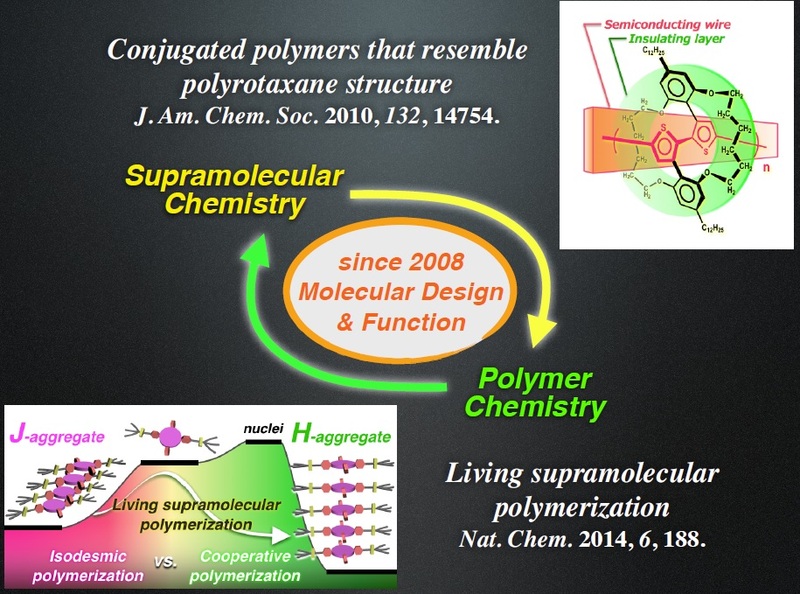 To explore the potential of molecules, we learn from the concepts developed in supramolecular and polymer chemistry (Figure). By molecular design, we can control properties, functions, and behaviors of molecules. For example, we have recently succeeded in “living supramolecular polymerization” through a careful molecular design (and fortuitous finding which gave me some inspiration). We found that a subtle structural modification in the monomer significantly influenced the final outcomes, yielding one- and two-dimensional supramolecular polymers. I would like to discuss with you what we have done in the last 10 years in NIMS and like to have your feedbacks which will change my way of thinking/viewing molecules. K. Sugiyasu, Nat. Chem. 2017, 9, 493-499.